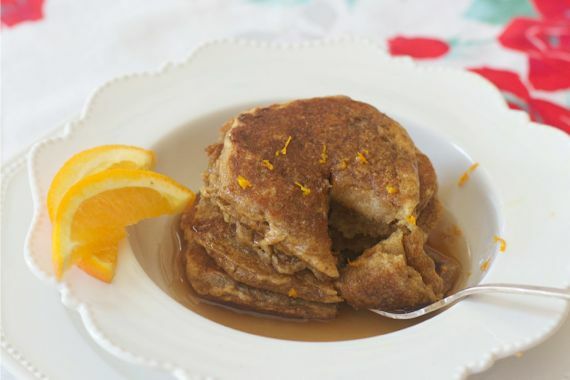 My inspiration for healthy spelt and flax pancakes with cinnamon and orange zest comes from my favorite french dessert, Crepes Suzette, only this is a little healthier. Orange zest is powerful and pleasurable and a little goes a long way in waking up a recipe, especially when paired with vanilla or cinnamon. Sometimes just to have a nice smell in the kitchen, I’ll boil water and add in orange slices, vanilla and a cinnamon stick and then let it simmer on the stove. 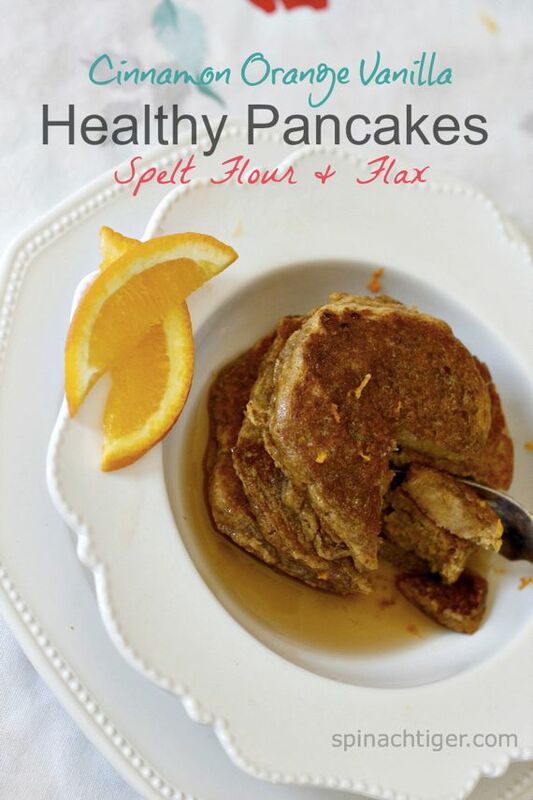 Spelt and Flax Pancakes are so healthy and fluffy. This is a little different than the banana honey spelt pancake and or the strawberry spelt pancake. Those pancakes used apple sauce instead of fat and cook differently. 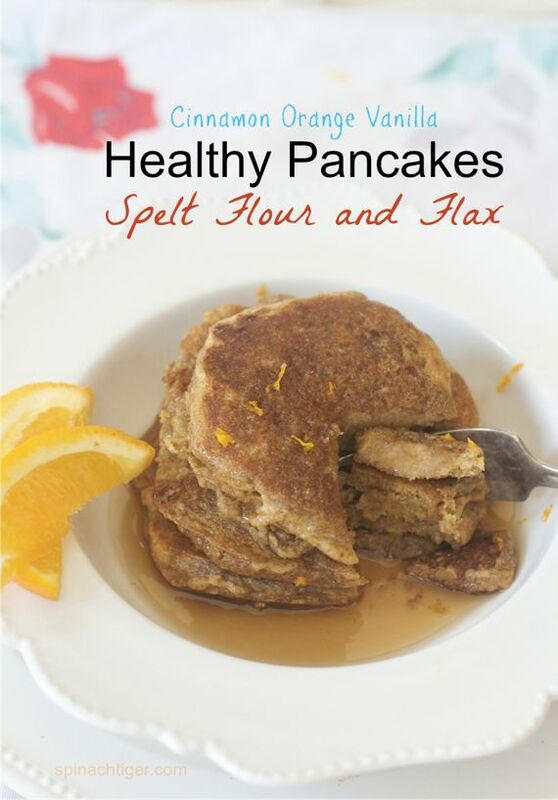 These spelt and flax pancakes makes a fluffier pancake, but not dense or heavy. 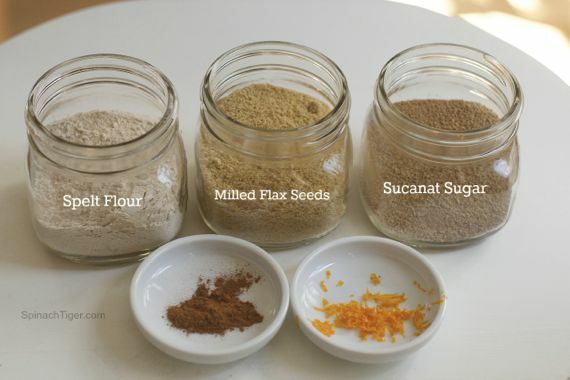 I used milled flax seeds (which are ground up flax seeds) which is a fiber and nutrition booster. Everyone knows by now flax seeds are high in omega 3 fatty acids, but there are many benefits. I use them in smoothies, and yogurt. The batter is thick and may seem odd for pancakes, and it almost seems like they aren’t going to cook. Cooking pancakes is always tricky for most people. I used a cast iron griddle with hardly any fat. I used a paper towel to glisten oil in the seasoned pan and that’s it. I was patient. These pancakes don’t bubble up the way thinner battered pancakes do, but take a look at the edges to see when they are ready to turn. I started with a medium high heat, but quickly turned to a low heat because cast iron retains heat so well. The flavors are amazing, as you smell and taste the orange and cinnamon gathered in a fluffy textured pancake. We used plain maple syrup and an added dash of orange zest. I made two batches right in a row and every single pancake disappeared before lunch. I have a feeling that these are going to be my most requested pancake in the future. I have spelt flour in the pantry and never think to use it. I will now. These look so tasty. I do hope you try. I’ve done a lot with spelt lately, and I’m enjoying it. Lorraine, Crepes Suzette. I would walk a lot of miles to get get. Yum but on healthier days, these are great. These sound simply fantastic. I love the grains and the zest and, well, everything! Yes, Lynda, the zest adds that touch. I have been eating pancakes non-stop during my pregnancy, so I’m always looking for a new and healthy recipe. These look perfect! Thank you for sharing. I’m glad I found your blog today! Welcome and congratulations on your pregnancy. I hope you do both enjoy.